TUESDAY, APRIL 12, 2016 WAS A DAY OF CELEBRATION FOR GDN! 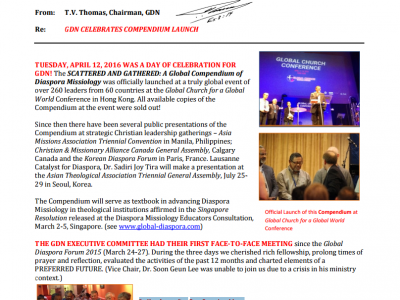 The SCATTERED AND GATHERED: A Global Compendium of Diaspora Missiology was officially launched at a truly global event of over 260 leaders from 60 countries at the Global Church for a Global World Conference in Hong Kong. All available copies of the Compendium at the event were sold out!